City Harvest volunteers help ensure that good food doesn’t go to waste. Whether you have experience in teaching and nutrition, are interested in working with local farmers, or simply want to give back to your community, your passion and time are important resources in the fight against hunger. Learn more about individual volunteer opportunities. 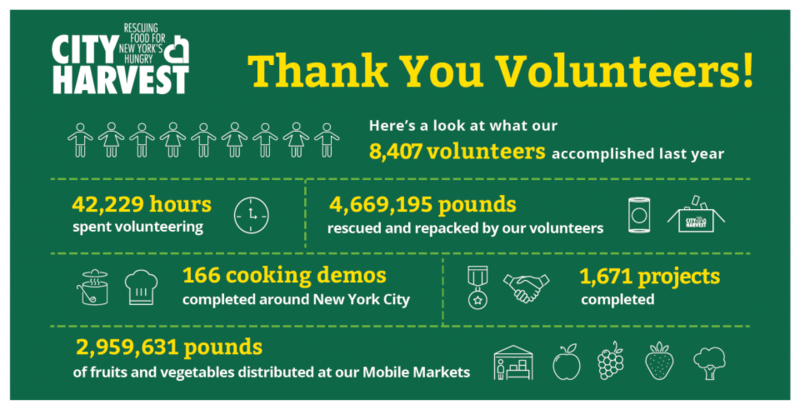 Volunteers from hundreds of companies and community organizations located in New York City generously donate their time to help City Harvest feed our city. Find out how you and your group can team up to help feed our neighbors. Learn more about group volunteer opportunities. More info? Try our Volunteer FAQs.